One of the early, profound insights regarding the biology of the neural crest was the observation of its contribution to the skeletal structures of the cranium and jaws. The critical nature of these structures made the comparative analysis of the cranial neural crest and its derived structures essential investigative aims toward our understanding of the development and evolution of vertebrates and vertebrate-specific structures. Though classically applied to a relatively wide range of taxa in the nineteenth and early twentieth centuries, the application of traditional methodologies for complex comparative developmental and anatomical analyses subsequently become more limited by their time-consuming nature, resource scarcity, and a greater emphasis on the genetic and molecular regulation of patterning and morphogenesis in a select number of tractable model organisms. Recently, however, this trend has been reversed, and the value of genetic and molecular-based questions applied to non-model (unconventional) vertebrate organisms has been re-appreciated. This is particularly true of comparative investigations of cranial neural crest biology. 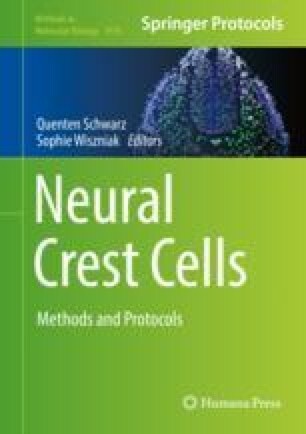 Herein, we present methodologies for the analysis of the cranial neural crest and its structural derivatives employable in modern investigations of both model and unconventional vertebrate organisms.